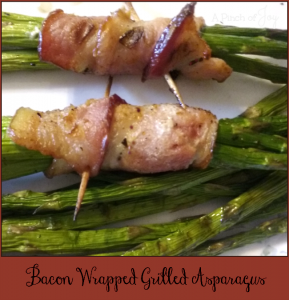 Bacon wrapped grilled asparagus was on the menu when we were guests at a birthday dinner early in spring. My mother loved asparagus. Wheels loves asparagus. Me — no. I would buy it for them, but eat it. . . emphatically NO. Not at all. Never. No asparagus crossed these lips. I had tasted it. Once. Bad memory. Even the name – *shudder*. However, this time the grill meister handed me the plate to carry to the table and casually said, this is pretty good stuff. Maybe it was the enticing smell of the bacon. Or the festivities. Or my good manners kicked in. Whatever it was, I put a bundle on my plate as it came by during dinner. Wheels raised an eyebrow and kindly gestured that he would rescue me from the asparagus ever so discreetly since I surely had taken it by mistake. But I was committed. I gamely took a bite. Not at all what I remembered asparagus to be. Tender, gently flavored, grilled to perfection and wrapped in bacon. It was soon gone. I liked it! When Bytes and his big brother were small, I would entice them into trying a food they had rejected before by saying “You know, your taste buds are growing up too. Maybe you are big enough now to like (whatever )”. Worked. They will eat anything now. Guess what. I was right all this time. Hear that – Mom was right!!!! Mom’s taste buds grew up. She likes asparagus. Lightly grilled and wrapped in bacon, please. This is more a set of cooking guidelines than a recipe – results are delectable! Separate three stems of asparagus from bunch. Optional step: If you want bacon just slightly crispy, precook in microwave or skillet until it begins to brown and continue with the next step. Wrap the three stems together with a half slice of bacon and secure with toothpick. Place each bundle of three on a medium hot grill and cook until asparagus is tender, but still slightly firm and bacon is cooked.